Exports to Hundreds of Adoption Websites and Services - Free! When you post your adoptable pets with us, we can send them out to over 200 pet adoption listing websites. You have full control of where your pets appear, and it's all done for free. That means that our one-and-only mission is to help the community and no one is profiting personally from what we are doing. You won't find any ulterior motives in what we do. We receive many testimonials from organizations who want to let others know of their great experiences using RescueGroups.org services. We take security very seriously. Our data management website uses SSL to protect your account information, and we require every user to have their own user name and password. Most volunteers don't have time to update more than one or two websites. Our online animal management software tools such as the Pet Adoption Portal, Data Management Service, and Website Service can automatically send your animal data and pictures to a long list of websites. You update only one pet list, and the other websites get updated! 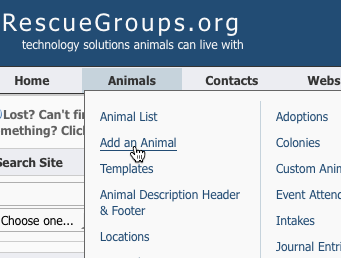 Since 2002, RescueGroups.org has provided animal welfare organizations with easy to use, free and low-cost services like the Pet Adoption Portal to help maximize animal adoptions. No matter what level of service you choose, you'll get the best services and support available so you can spend less time in front of a computer and more time doing what you love - helping the animals!